Sun Glazing and Fabrication was envisaged by a professional Mr. Y. Madhu Sudhan to meet the needs of Modern Structural Glazing and Fabrication assignments. From the inception this company has started prestigious projects such as Hyderabad International Airport with professional approach and team work. Unitized/ Semi unitized Structural Glazing using Double/ Single Glazed glass. Double Glazed / Single Glazed Openable / Sliding doors and windows. Special Hinged Partitions using toughened glasses and Dorma / Equivalent Hardware. Sliding-Folding / Circular Doors / Partitions. For Glass we use expertise of Mr.Naren of Saint Gobain Glass Chenni and Mr. ChandraSekha of Saint Gobain Glass Hyderabad for various glass performance and Leed certification purposes. For Spider Glazing consultancy and supply of 316 grade Spider fittings we have Mr. Tanuj of M/s Kinlong Architectural Glass fittings co. China as our regular supplier. 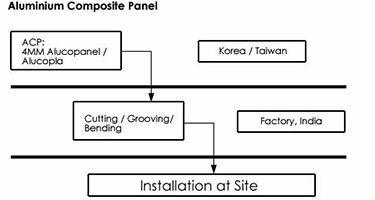 For supply of Aluminum Composite Cladding materials and consultancy we have M/s Alucopanel, Korea, Alpolic, Japan and Alcopla,Taiwan as our suppliers.